An Amazing Fact: The sperm whale is one of the biggest mammals on earth, growing to more than 65 feet long and nearly 65 tons. But it’s also well-known for having one of the loudest calls in the animal kingdom. Its short, echolocation clicking noises can reach 230 decibels—your eardrum can rupture at 165 decibels! 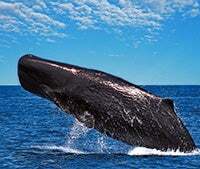 Researchers believe these low-frequency sounds can travel over 10,000 miles in ocean waters. How far away can your voice be heard? The normal range without amplification is about 600 feet. Some powerful human voices, like that of evangelist George Whitfield, can be heard over miles. In one case, under optimal conditions, a human voice was detected at 10.5 miles across still water at night! Yet louder than any human or animal voice is God’s message of everlasting life—a message of hope that you are bringing to countless listening ears all around the globe. Indeed, your gifts of love express the loud cry of Jesus Christ even in some of the most isolated places on earth. It breaks my heart that so many lonely souls have no church to call home. Many are longing for truth, weary of hearing doctrines from pulpits that don’t match what their Bibles say about the Sabbath, the afterlife, and the Second Coming. While their pastor has rejected their call for worship reformation, Mrs. Li says her group has faithfully “decided to keep the Sabbath. We have more than a hundred people gathering together each Sabbath to watch Pastor Doug’s sermons and study the Bible. We thank God and ask for His continued leading.” Amen! Praise the Lord that these souls, who don’t have a Sabbath-keeping church nearby, can now join Amazing Facts each week for solid Bible teaching. I thank Him for your faithfulness to provide a pulpit to the world—one that is preaching pure truth from the Word! Friend, you are loudly proclaiming God’s final message and preparing hearts for Jesus’ return everywhere! But we can’t rest now—indeed, the need to sound the final warning message across the planet is greater than ever before. Did you know that just last year, the world’s population grew by over 80 million? That’s now 7.2 billion souls who need Jesus. Yet only a small fraction of them have heard the Savior’s name, and even fewer have heard the full three angels’ messages. … it’s still not enough to keep up with the need to reach every nation, tongue, and kindred with the life-transforming name of Jesus—before it’s too late. Because of your faithfulness, Amazing Facts is boldly moving forward on building the 96,000-square-foot W.O.R.D.—World Outreach, Revival, and Discipleship—Center on a hilltop just outside of influential Sacramento, California. This much-needed facility will be the home of a modern church auditorium, where we can record and broadcast Bible programs at a higher quality and quantity than is currently possible. Programs for you to watch and to help reach your neighbors. It will also be a center of missionary training for thousands of men and women who will travel to foreign lands and plant new Sabbath-keeping churches. That’s why it thrills me to see the W.O.R.D. Center taking shape. Site preparations are nearly complete—utility lines are in place, mountains of dirt have been moved, and foundations have been poured. But today, we are still short $3,000,000 to fully fund this project. We don’t want this to stall in its tracks, and I believe the Lord will move on the hearts of His people to overcome this shortfall and reach the finish line just ahead—without having to slow down our other ministry programs. Will you please take a minute to get on your knees and pray for God to be honored through you and this ministry expansion? You won’t be alone! Right now, dedicated partners will double your gift’s effectiveness this month by offering a $435,000 matching gift toward the W.O.R.D. Center. That means your gift of $10 this month will actually be $20 to expand worldwide evangelism. $50 will become $100. And your gift of $100 today will be $200 toward soul-winning broadcasts. Now is the time to turn up the volume and loudly proclaim God’s final message to the world. Soon it will be too late to invest in the winning of souls. But today, the doors are open to preach the gospel through our multimedia ministry. Let’s broadcast the Word together—loud, bold, and clear!